On Sunday I rode up to West Point Inn for the pancake breakfast. I saw plenty of friends there that had the same idea. Sadly they were on cross bikes while I was on the mountain bike intent on trail riding. The ride – Tenderfoot: Cypress: 777: Gravity Car: Railroad Grade: West Point Inn: Railroad … Read morePancakes on the mountain. 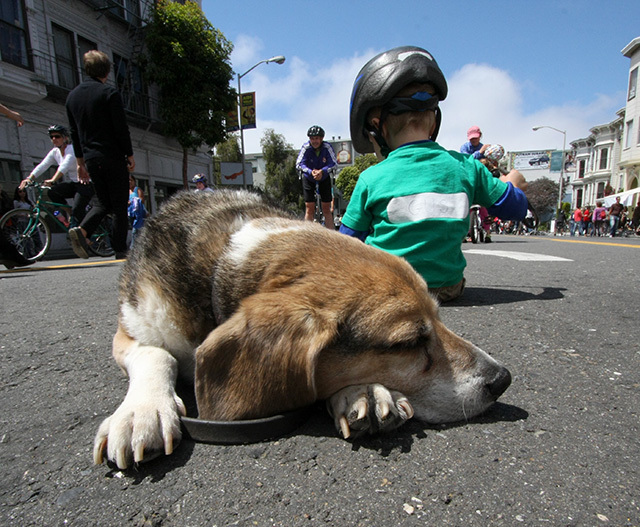 I love SF Sunday Streets. http://sundaystreetssf.com/ It’s a perfect way to get out and honestly see the people of the city around you. Go to the next one! Having one dog around is awesome. Two is even better. Here Maggie is posing with another dog at Stray Bar where we go for Smarty Pants Trivia Night on Tuesdays. There are usually at least 3 dogs on the scene and sometimes a few more. Later in the night a brown pitbull named Rufus showed … Read moreTwo dogs. “Home is where the heart is.” It’s so true. Home is a place you know when you are there. I was feeling that this weekend on a mountain bike ride in Marin. I was on a section of singletrack waiting for the dog to catch up to me, just hanging out in the middle of … Read moreHome. One thing I love about San Francisco is that this city will close down a street or entire part of town for almost any reason. On any given weekend throughout the summer you will find several miles of “Closed for Party” road. This July 4th was the 2010 Filmore Jazz Festival. 12 solid blocks of … Read moreSF loves to close it’s streets! Hey Folks. I’m just setting this site up again as a handy hub for all the stuff I have going on. Take a look through the menu above. If you hit an empty page, don’t dispare. I’ll have everything somewhat sorted in a few weeks. Check back in a bit.